At intersection of Coffee county Road 494 and State Highway 52. 6/10 mile asphalt trail around the outside of 3 ball fields with lighting. The trail is a flat surface with curves, slopes and benches located around the trail. 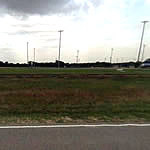 Regulation High School Baseball and Softball fields, and a Dixie youth baseball field.